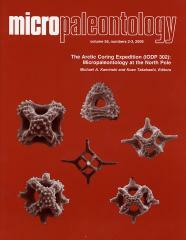 ABSTRACT: Planktonic foraminifera populations were studied throughout the top 25 meters of the IODP ACEX 302 Hole 4C from the central Arctic Ocean at a resolution varying from 5cm (at the top of the record) to 10cm. Planktonic foraminifera occur in high absolute abundances only in the uppermost fifty centimetres and are dominated by the taxa Neogloboquadrina pachyderma. Except for a few intermittent layers below this level,most samples are barren of calcareous icrofossils. Within the topmost sediments, Neogloboquadrina pachyderma specimens present large morphological variability in the shape and number of chambers in the finalwhorl, chamber sphericity, size, and coiling direction. Five morphotypeswere identified among the sinistral (sin.) population (Nps-1 to Nps-5), including a small form (Nps-5) that is similar to a non-encrusted normal form also previously identified in the modern Arctic Ocean watermasses. Twenty five percent of the sinistral population is made up by large specimens (Nps-2, 3, 4), with a maximal mean diameter larger than 250Âµm. Following observations made in peri-Arctic seas (Hillaire–Marcel et al. 2004), we propose that occurrence of these large-sized specimens of N. pachyderma (sin.) in the central Arctic Ocean sediments could sign North Atlantic water sub-surface penetration.